I was really curious when I first was approached to review this series. Fringe by all accounts seemed that it would be somewhat an X-Files clone and as much as I had enjoyed that series, it had been done before, with great success. It was with much pleasure as I sat to watch this series on Bluray (which is a spectacular transfer by the way) that I am super pleased to tell you that this series is well worth the time and effort to sink your teeth into. Is it the best series available at the moment? I wouldn't go that far, but if not the best then most definitely one of the best. That my friends is without doubt. The way the series is shot along with the main characters, being Olivia and the son/father team of Peter and Walter is truly exceptional. So, I hear you asking, what is Fringe about? Well without going into too much detail that would wreck your enjoyment of this show basically Olivia is an FBI agent tasked with solving odd scientific cases or things that fall outside the normal range of the FBI. She is also charged with working with both Peter and his genuis/crackpot father Walter who is as absent minded as he is unorthodox and brilliant. Walter is able to see outside the square for the simple fact is that for him, the square simply does not exist! The way that JJ Abrams and others involved in the production of this series have fleshed out the characters is lovely. They grow as we watch; from Peter being the sceptic who is simply onboard to keep his odd father in check, to Olivia being the held back reserved woman who simply gets the job done, to Walter himself the crackpot. We see these characters grow and change possibly with the exception of Walter who is so brilliant as a character that if he was to change it would be to the utter detriment of the series. Considering a key part of the storyline is that Walter spend the last 17 years in a mental institution also provides a bit of a reason that he does not see the world the same way that we do. 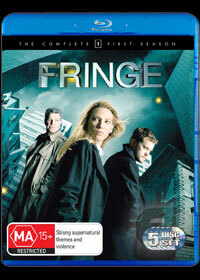 Fringe captivated me the entire way through to the brilliant season finale that had me on the edge of my seat. After an entire season of watching both the macabre and beautiful, evil and good all parade themselves before our heroes, to the twist at the end that I simply cannot ruin for you….. Referring to the fringe of science as curious phenomena is explored, Fringe is an example of just how good television can be.